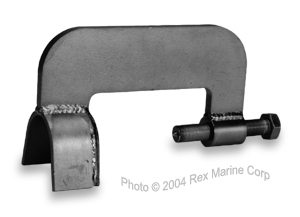 Our 4140 Steel Prop Puller is the strongest of its type. Precision engineered for both strength and proper fit even with 3-blades, this puller is truly the best. When the proper procedure is used, it will not bend or break. Proper pulling procedure: Leave the nut loose, but threaded on the end of the shaft to avoid the prop flying off and hitting you or someone else. Preload the puller bolt, then hit the end of the bolt with a hammer. Apply heat if necessary. Important... Do Not attempt to torque the prop off with the puller bolt - Puller and prop shaft end damage will occur. Preload, shock & heat is the winning combination here. A little anti-seize when you install a prop is helpful too.